I know this is a very old post, and there probably is not a chance to receive a reply, but I believe your puggle Madison was part of the same litter as my puggle dog Bailey (Trista). Your arrival date looked to be April 20th 2008 and ours was April 21st 2008. Bailey is almost 10.5 years old now, and she has been the light of our lives for the past 10 years. Our baby in every way and she has provided us with Moreno love than anyone could ever hope for in a lifetime. I hope we have done the same for her. As she is getting older, I am hoping to connect with others with what you are noticing with age. There are times when Bailey still plays like a puppy, but she is slowing down tremendously. Now I think she is experiencing some joint aches as well. Just wondering how your puggle is doing? Thanks! Madison (Daisy) is home safe and sound in Northern Virginia. She is the most precious baby girl we have ever seen and has just been wonderful! The puggle puppy has melted our hearts, and it wouldn't have happened without you! Even our vet said how organized you are. Thank you for everything and all the feedback that made the process very easy. Daisy is smart and sweet and soooo good! It is very clear that she had a wonderful first couple of months in your care. She has been socializing and getting along with everyone we meet. We are all very happy here. Thank you! My fiancé, David, adopted a mini dachshund puppy from you back in December as a surprise Christmas gift. I just wanted to let you know how great he is doing! Hershey, now known as Frankie is a playful love bug and is growing each day! He loves to run around outside and play with his big brother Shinobi. He is very loved and has been a perfect addition to our family. Also, I wanted to thank you for your timely assistance with his flight rescheduling (as his first flight was cancelled due to a snow storm). I highly recommend your business and we will definitely look to adopt another puppy from you in the future! Russell and I purchased ( Manning) french bulldog in December... we are so thrilled with this little guy... I want folks to know how great you was to work with and a very reputable breeders.. Two attempts previously we hit against scams and thank god you renewed our faith in good people.. We are 100 % happy with our new family member.. Thank you so very much!! Will you be having a litter of MaltiTzu's soon? We love our little Mckenzie, aka Valeria, and want to know as she really needs a little play mate. We absolutely love the mixed breed. She has been a perfect addition to our family of 2. Hello. 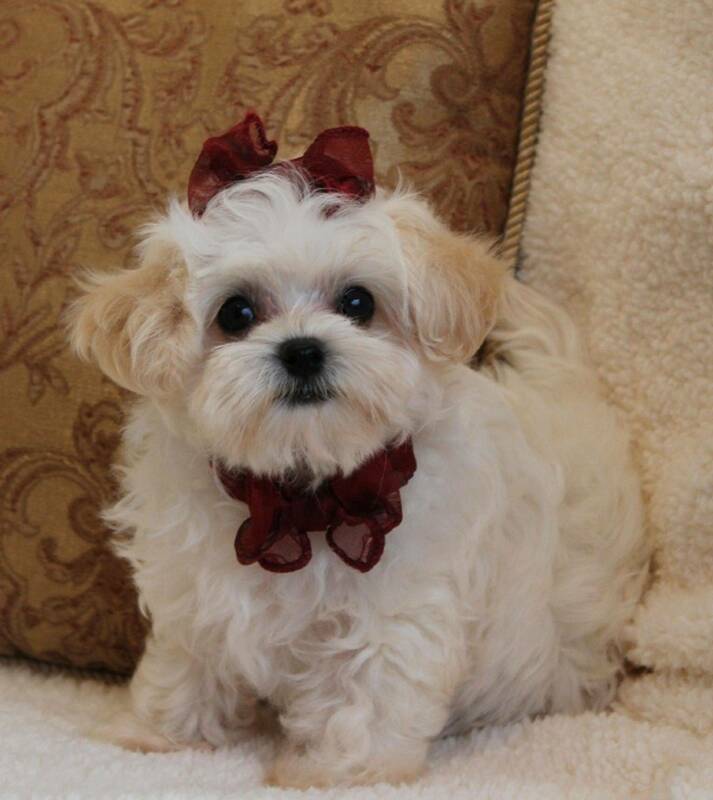 I purchased a Maltese/shitzu mix from this family in october 2007. When i recieved my pup, She was in great condition. Now, She is still doing great with a healthy check up. She is so smart and never barks! i will always get puppies from here in the future. The family is so nice also. i was highly reccomend this website! Hello. I must tell you that your website is a real pleasure. I have been on the internet for several weeks looking at puppies, and the presentation and photography on your site is superior to the vast majority of other puppy sites I've seen. Plus your puppies overall look so healthy and all are beautiful. None are quite what I'm looking for at the moment, but I've bookmarked your site and will keep you in mind.